Enjoy books all summer and record how many minutes you read. Every minute helps you earn stellar beads to decorate your out-of-this world necklace you select at the beginning of Summer Reading. How do I Read & Bead? 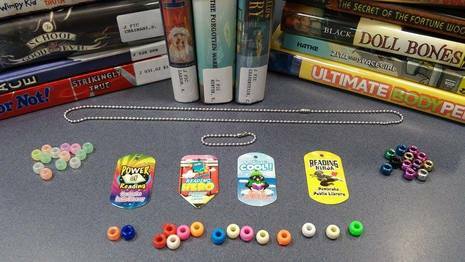 Brag Tags, beads, and books for your Summer Reading. Reading lets you use your imagination and learn new things, but Summer Reading comes with extra special stuff! Select your Brag Tag design and a necklace or key chain. Turn your minutes into beads for your chain! Log your minutes with the Library either online or by visiting. Each bead represents different numbers of minutes. Every participant in the Read and Bead Club wins a FREE book. Visit the Library after Thursday, August 22 to select your book. Our Read & Bead Club is open to ages 3 to grade 6. We also have programs for babies & toddlers (Rubber Ducky Club), teens (Team Read Club), and adults (Pages & Prizes Club). Just sign up online or visit Pembroke Public Library. Sign up anytime before the final week. Other events will be happening all summer long. Check out our Events page for more. What can I read/have read to me? Anything! This includes graphic novels, comics, magazines, books (nonfiction and fiction), eBooks, audio books, and more. Not sure what to read? We have suggestions on our site and our staff is always ready to help find a new book for you. A leveled suggested reading list is available online and in the Library; this resource was created as a collaboration between the local schools, library, and other national educators. Students also have access to LexiaCore5, an online reading skills program. Visit the Elementary Summer Reading page for the schools for login information. All Pembroke Public School Students may visit the Summer Learning Guide for elementary, middle, and high school students with resources, activities, and links to engage children and teens in math and reading throughout the summer.